World Comics India is the first organisation, which has presented a systematic curriculum in Comics Journalism. Comics Journalism is a new phenomenon. Here creator use visual medium to tell the story or disseminate information. Comics Journalist travels to one specific area to collects information, documents and incidents. S/he draws live sketches, collectes visual information (as much as possible), draws info-graphics and later weaves them all in one story format. These stories are usualy presented in same old comics format. These stories are mostly first person accounts, but not always. What makes them different from regular comics is their authenticty, non-fictional nature. Most of the time reader can see the journalist as a storyteller, which makes the report more reliable and authentic. 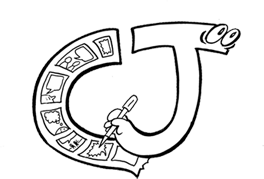 WCI started working on comics journalism idea in 2004. WCI founder Sharad Sharma designed a project in which he assigned 15 comics journalists to report on development issue. How these common people living in fifteen different states of India see developemnt in last sixty years of independent India. Though none of them were an artist, but were familiar with the basics of the comic making. It took four year to complete this self-funded project. These fifteen stories were developed in several different languages, later after translation these were published as an anthology in both English (Whose Development) and Hindi (Vikaskaal Vipreet Buddhi) languages. The work World Comics India does is not only important and impressive as it empowers people who often do not have a voice in society, but also as it results in interesting, moving and engaging comics. In this book, these comics journalists has created just that, showing us the way it is, using the power of comics. Sharad Sharma's persistent dedication to using comics as a tool for change is both inspiring, and also just what we need in the (mostly hi-tech dominated) world of infoactivism!